Auto Loan Affiliate Program. Offer Car Loans on your Website. Auto Credit Express has designed an auto loan affiliate program that gives you more opportunities to earn money, and we will provide you with all the resources that you need to become a successful auto loan affiliate. A dedicated Affiliate Representative who is familiar with you and your web site will respond to your inquiries in a timely manner. 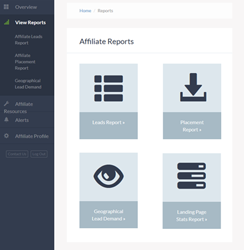 Real-time reporting will allow you to monitor referrals, conversion and your payments. Tested and optimized landing pages and application forms are available to you. An optional customized application form takes on the exact look and feel of your web site. For more information about our skinnable application form, please see the Creative Solutions. ACE accepts 100% of all valid U.S. applications submitted. We also accept applications from certain areas in Canada.